This site on the edge of Welwyn town centre in Hertfordshire presented a fabulous opportunity to work in an unusual setting with challenges associated with the diverse edge conditions: dense woodland and a busy motorway slip road. Deep reveals and projected windows create a richness in the elevations, and this high-quality aesthetic makes the scheme a unique yet sensitive addition to Welywn's built fabric. 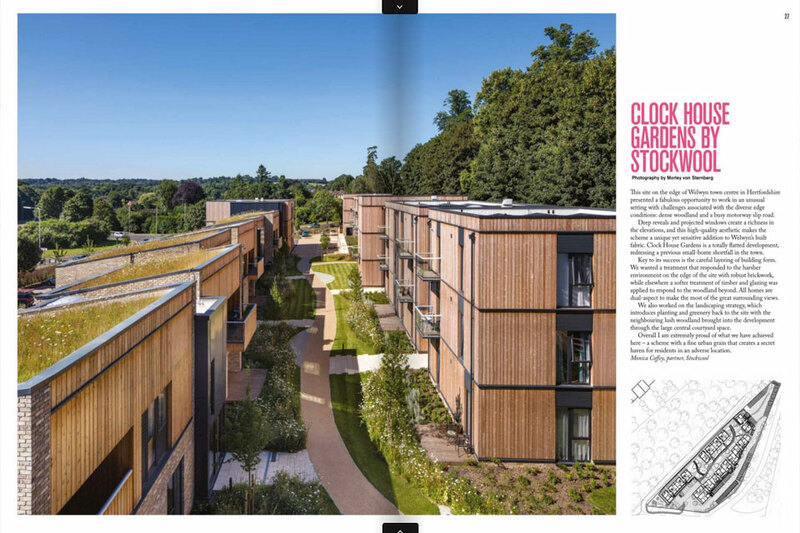 Clock House Gardens is a totally flatted development, redressing a previous small-home shortfall in the town. Key to its success is the careful layering of building form. We wanted a treatment that responded to the harsher environment on the edge of the site with robust brickwork, while elsewhere a softer treatment of timber and glazing was applied to respond to the woodland beyond. All homes are dual-aspect to make the most of the great surrounding views. We also worked on the landscaping strategy, which introduces planting and greenery back to the site with the neighbouring lush woodland brought into the development through the large central courtyard space. Overall I am extremely proud of what we have achieved here - a scheme with a fine urban grain that creates a secret have for residents in an adverse location.